Traveler behavior and expectations are changing—are you keeping up with the trends? In the next ReviewPro webinar we discuss how to leverage key trends in 2019 to take the guest experience to the next level. 1. Keeping on Top of Guest Feedback. Review volume was up by 30% last year, and guest feedback channels have proliferated. How can hotels stay on top? And what does TripAdvisor’s new travel feed mean for hospitality businesses? 2. Leveraging Integrated Data. After years of fragmentation of guest feedback, data integration is finally happening. What does this mean for guest experience management, and how can you take advantage of enhanced tools and functionality? 3. Delivering Real-time Guest Service. Travelers’ expectations of speedy responses to questions and concerns are higher than ever. How can hotels implement systems and processes to exceed expectations and deliver operational excellence? 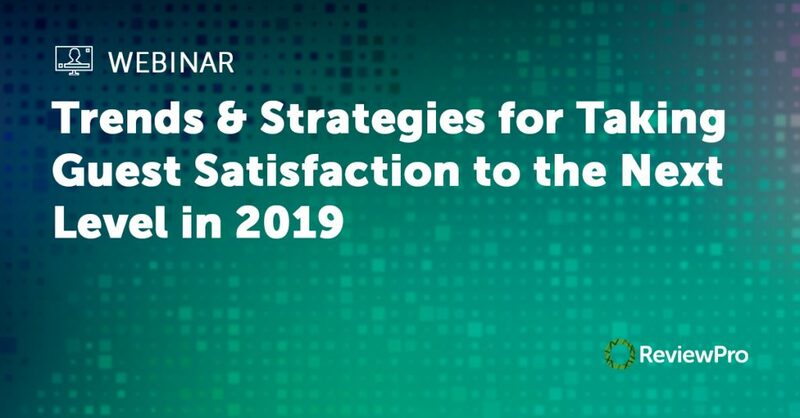 Would you like to find out how to boost revenue in 2019?